What is the Backstage Pass Loyalty Program? How can I sign up for the Backstage Pass Loyalty Program? What is my Backstage Pass ID Number? When should I give my Backstage Pass ID Number? How do I earn points on my Backstage Pass account? Can more than one person use a single account? Is membership in the Backstage Pass Program free? How can I see my point totals? Can I apply for the Backstage Pass online? When I purchase tickets or gift cards online, will I receive Backstage Pass points? 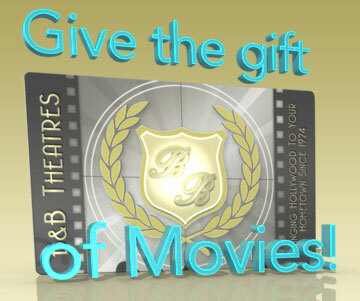 Are all B&B Theatres locations participating in the Backstage Pass Loyalty Program? Why am I required to give my full name, email address, phone number, birth date, and zip code when registering for the Backstage Pass? B&B Theatres offers a loyalty program which awards customers points based on admission and concession purchases, special promotions and discounts, and access to exclusive events. This program is called the Backstage Pass. Whenever a Backstage Pass member presents their Backstage Pass ID Number (the phone number given when the account was created) at the Box Office or Concession Stand prior to making a purchase, their account is accessed. Points are added to the account based on the dollars spent in the subsequent transaction. Those points can be redeemed as vouchers at a later time for discounts on concessions or admissions. The program also affords members various additional benefits, which are outlined below. On Tuesday’s! -$2 Off tickets* and any size popcorn and soda (some exclusions apply) select blackout dates may apply. Guests can sign up for the Backstage Pass Loyalty Program at the Box Office using a Backstage Pass sign-up form. Registration is quick, easy, and free. When signing up for a Backstage Pass, guests will be asked to list a phone number in association with the account. This phone number will serve as the Backstage Pass ID Number, and will be used to access the account at the Box Office or Concession Stand. Each and every time a purchase is made, Backstage Pass members should give their Backstage Pass ID Number to the B&B Theatres associate at the register. The Backstage Pass ID Number is the phone number used to create the account. Points are earned as purchases are made on the Backstage Pass account. Provided that the Backstage Pass ID Number is given at the point of sale, points can be earned through the purchase of tickets, concessions, standees, alcohol, gift cards, and any other item available for sale at any B&B Theatres location. When a B&B Theatres associate accesses an account at a register, the display will indicate the accountâ€™s point total and available benefits. At this point, discounts can be applied to qualifying items, vouchers can be redeemed, and other applicable promotions can be accessed. While this is certainly possible, it is advised that individuals maintain separate Backstage Pass Loyalty accounts. Due to the customizable and customer-specific nature of particular Backstage benefits, B&B Theatres is able to provide more appealing promotions to members that do not share accounts with others. At the present time, there is no cost to join the Backstage Pass Loyalty Program. Point totals can be reviewed at the Box Office or in emails that go out to members on a semi-regular basis. Guests will be given the opportunity to enter Backstage Pass Numbers when tickets are purchased at movietickets.com. For gift card purchases, the sale must be made in person at the Box Office in order for Backstage Pass points to be awarded. B&B Theatres is undergoing a significant software upgrade in order to improve the customer experience at every location. The installation of this software upgrade allows (among other things) the application of the Loyalty Program. Guests who are interested in finding out if the program is available at their local theater are encouraged to reach out using contact information found at bbtheatres.com. All of the information collected from the Backstage Pass registration form is used to enhance the customer experience and expedite the application of the program at the point of sale. Name and phone number are required to access and verify account holder identification. Email addresses are used simply to communicate promotions and program updates to members and will not be sold or spammed. Birth dates are used only for the purposes of guest-specific promotions (birthday coupons), and zip codes help B&B Theatres to track Backstage usage and improve the customer experience.